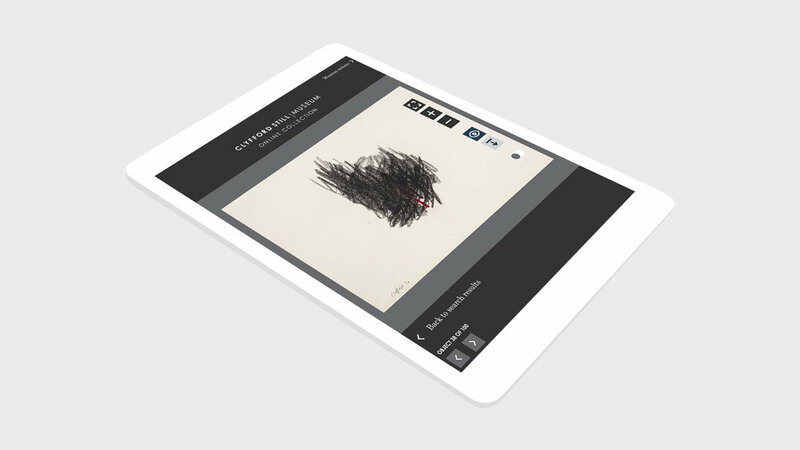 The Clyfford Still Museum is “among the best art museum experiences anywhere” (Smithsonian Magazine), and they have now extended the amazing experience with a new online collection designed and built by Cogapp. Most of the artworks in the new online collection are being seen on the web for the first time, including paintings, works on paper and sculpture. Searches are filterable by multiple categories including year, material and location. 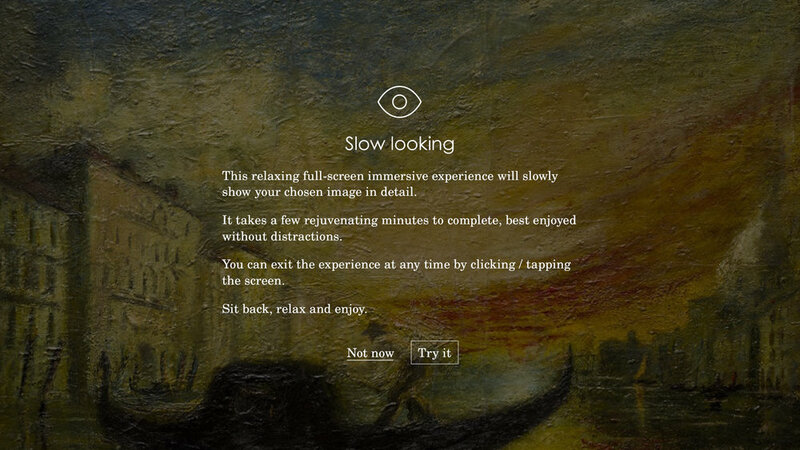 Website visitors can choose to view the high-resolution art against a grey background, like in the museum, or against a white background. All images have deep zoom and full screen enabled for an immersive experience. Artworks are downloadable, providing open access to everything in the online collection. The header changes using some of Still's better known pieces as backdrops, and of course the site is fully responsive across devices and tested for accessibility. As more content is added to the collections management system, it will automatically appear in the online collection. The Still Museum conducted research that shows their audience has a large proportion of what John Falk calls Rechargers - people who yearn to physically, emotionally and intellectually recharge in a beautiful and refreshing environment. We saw an opportunity to deliver an equally recharging experience online, and developed slow looking for the Clyfford Still Museum Online Collection. Find out more on our blog. We believe this is the first digital implementation of this kind of immersive experience across an entire museum online collection. "Creative, skilled, and attuned to the Museum’s mission, Cogapp has been the ideal partner for this challenging process. Our complicated vision is now a reality—although it looks and feels like a dream." - Dean Sobel, Director of Clyfford Still Museum. The project was featured across the media, including the New York Times. This is awesome. What a refreshing addition to a digital collex. Really well done. Congrats!! The Clyfford Still Museum use the Qi collections management system and Luna DAMS. Our system harvests collections data using the Qi API. Our custom Mill then processes and rationalises the data, e.g. sorting years into decades, grouping categories where required, renaming fields into user-friendly terminology etc. This data is pushed into ElasticSearch and exposed to the user via Laravel, an open-source PHP framework. Using Laravel makes the system flexible and future-proof. Images are served through IIIF from Luna. Images IDs exist in Qi thanks to a pre-existing integration, which dramatically improves page speed. Clyfford Still (1904–1980) was among the first generation of Abstract Expressionist artists who developed a new and powerful approach to painting in the years immediately following World War II. Still’s will stipulated that his estate be given in its entirety to an American city willing to establish a permanent museum dedicated solely to his work, ensuring its survival for exhibition and study. The Still Museum in Denver holds 95 percent of the artist’s lifetime output, including approximately 3,125 works bequeathed by Still and his wife Patricia. The Museum has an ongoing programme of cataloguing, which will automatically add works to the online collection. 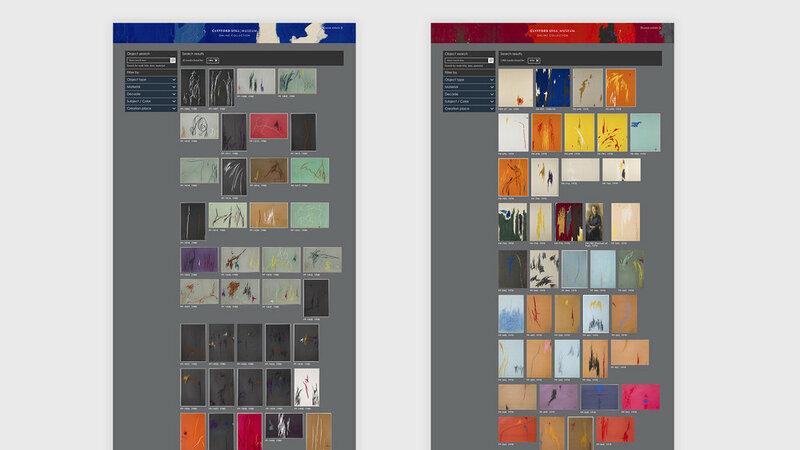 If you would like to know more about the Clyfford Still Museum Online Collection, or our experience creating them for The Met, MoMA, National Portrait Gallery and others, please get in touch.